HTC U11 was launched in June 2017. HTC U11 features a 5.5-inch Quad HD display with a resolution of 2560 x 1440 pixels. HTC is using the Super LCD 5 display with 3D Corning Gorilla Glass 5 on top. The highlight of U11 is its Edge Sense ‘squeezable’ feature, where a user can squeeze the smartphone to set certain commands and functions. HTC U11 comes in two storage options – 4GB + 64GB and 6GB RAM + 128GB storage. The storage is expandable up to 2TB. HTC U11 features a dual-SIM hybrid slot with microSD support. 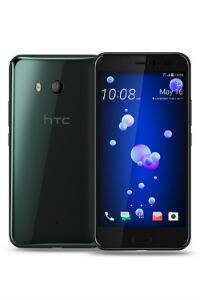 HTC U11 powered by 64 bit Octa-Core Qualcomm Snapdragon 835 processor with up to 2.45 Ghz clock speed. HTC U11 runs Android 7.1 Nougat with HTC Sense. The smartphone has a 3D Liquid Surface design and a glossy back. HTC U11 sports a 12MP rear camera with the company’s UltraPixel 3, 1.4μm pixel size, UltraSpeed Autofocus, BSI sensor, OIS, ƒ/1.7 aperture, and Dual LED flash on board. The camera is capable of 4K recording with 3D Audio, Hi-Res audio as well as Acoustic Focus. The front camera is 16MP with BSI sensor, live make-up, auto Selfie, Voice Selfie and HDR boost. It supports 1080p video recording. HTC U11 is a 4G-VoLTE enabled smartphone, and comes with IP67 rating. HTC U11 has a 3000 mAh battery. Sensors on the HTC U11 are Fingerprint, Ambient light sensor, Proximity sensor Motion G-sensor, Compass sensor, Gyro sensor, Magnetic sensor, Sensor Hub, and Edge Sensor. Connectivity options include NFC, Bluetooth 4.2, and Wi-Fi: 802.11 a/b/g/n/ac (2.4 & 5 GHz). Dimensions of the HTC U11 are 153.9 x 75.9 x 7.9 mm. HTC U11 will be available in two colour variants – Black and Silver.